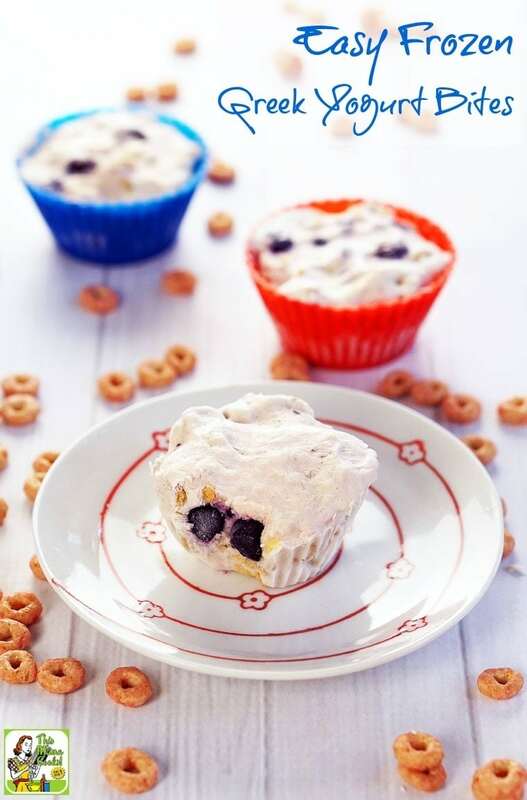 If you’re looking for a quick, easy breakfast ideas, you need to make a batch of these Easy Frozen Greek Yogurt Bites! 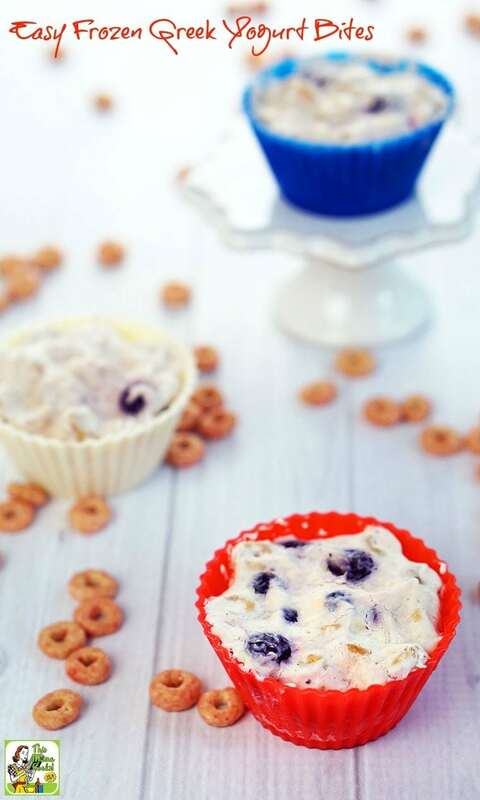 I love them because each frozen yogurt bit contains all the elements you want in a healthy breakfast recipe – fruit and berries, non-fat Greek yogurt, and gluten free whole grain cereal. Easy Frozen Greek Yogurt Bites are easy to make, too! I make each batch of yogurt bites in colorful silicon baking cups. It’s so easy to pop the bites out of the cups and store them in the freezer for breakfast. Or you can leave them in the baking cups for serving. They’re easy to clean, too, and great for making cupcakes or Picadillo Hash Brown Muffin Cups. You can also customize this quick easy breakfast recipe to what you have on hand or your personal preferences. Don’t like vanilla Greek yogurt, use blueberry! You can also make this dairy free by using a soy or coconut yogurt. Can’t find Strawberry Cheerios? 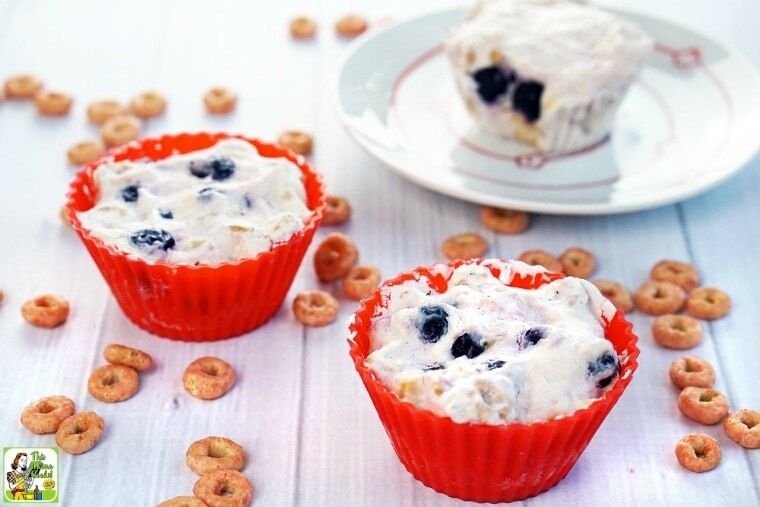 Use another variety of Cheerios or another brand of gluten free cereal in your Easy Frozen Greek Yogurt Bites! Dried fruit like raisins or cranberries would also be delicious in this frozen Greek yogurt bite recipe. Don’t like bananas like my daughter, Lucie? Then substitute applesauce for the bananas in this quick and easy breakfast recipe. Looking for more Greek yogurt recipes? Check out my Healthy Frozen Greek Yogurt Bark recipe! In a medium sized mixing bowl, mash bananas with a fork or potato masher. Add Greek yogurt, cereal, and blueberries. Mix thoroughly. Fill each silicon baking cup to the top. Place cups on a baking sheet and place in freezer. Freeze overnight. Store Easy Frozen Greek Yogurt Bites in a gallon freezer bag or a large freezer container. Wondering how many bananas (or how much applesauce) should be used for this recipe for best consistency? I don’t see it in the ingredients list. Looking forward to trying this recipe for my daughter. Thanks for noticing that it was cut off. It’s one cup sliced bananas. You can substitute one cup applesauce if you wish.